Kettles There are 7 products. Capelina Circular reinforced. It consists of a round shell with a riveted to reinforce band. 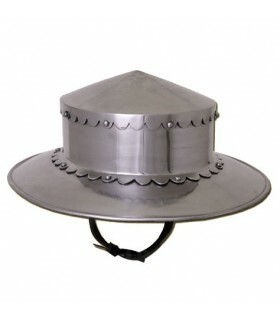 The wide brim protects the face from the blows. 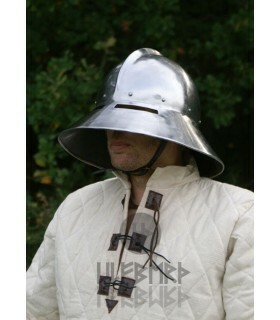 It includes chin strap with buckles. 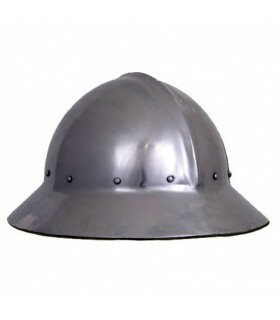 This helmet was widely used in the Middle Ages by the troops who were on foot. 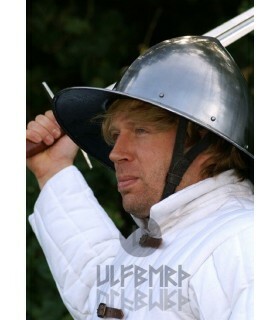 Kettle medieval helmet from the 14th century. It was usually used by the infantry troop. Made of 2mm steel. thick. Includes leather closure with brass buckle to hold on the chin. 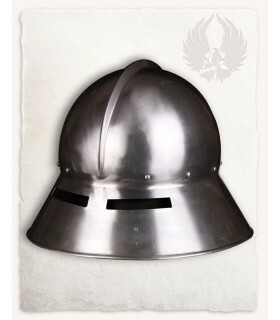 Medieval helmet Kettle round of the fourteenth century. It was usually used by the infantry troop. Made of 2mm steel. thick. Includes leather closure with brass buckle to hold on the chin. Medieval helmet Late functional Kettle with eye opening. 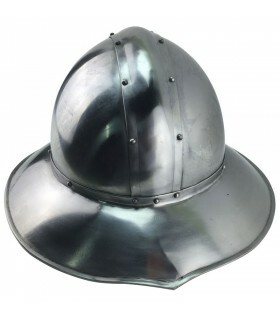 This helmet was very popular for pikemen or cavalry crossbowmen. Thickness: 2mm Includes adjustable leather lining and straps with chin buckle. 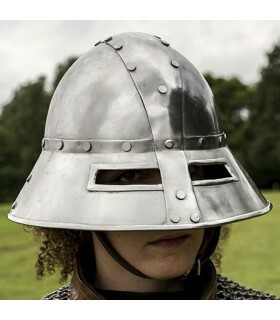 Kettle Swiss Helmet from the 14th century. Handmade in 1.6 mm steel. thick. Includes adjustable padded lining, leather strap and metal buckle.